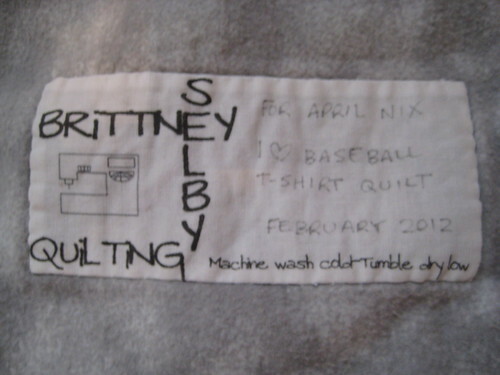 Brittney Selby Quilting: February is almost over! Well this quilt I finished up around the 7th of February but have been lacking in my blogging schedule so I am just now getting around to posting about it. One of Derek's co-workers collects t-shirts from vacations and such and wanted a quilt made from them. She sent over around 60+ tshirts so I split them into sports shirts and vacation shirts. 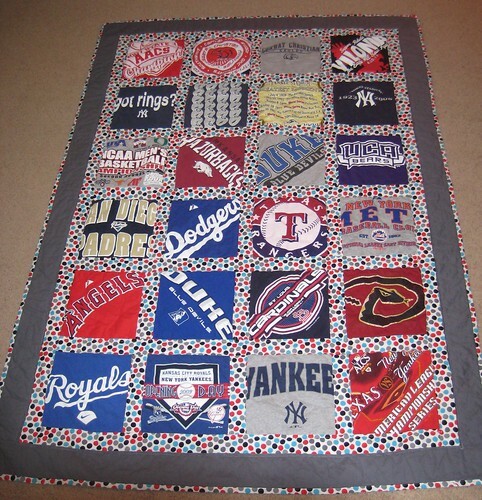 She decided that she wanted the sports quilt and I got set to make it. So I pretty much got the top finished up on Saturday. I almost ran out of the dot fabric but the mailman came with the fabric just in time. Here is the backing of the quilt. 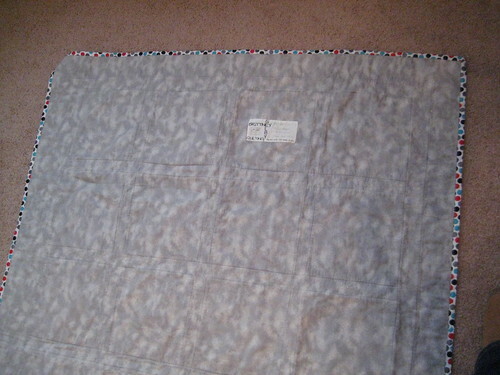 The grey flannel is quite snuggily and provides additional weight for the quilt. Here is my new quilt label that I had made at Spoonflower. I included washing directions since that can be confusing for some people. I even made a little mockup of my sewing machine to fit in on the left. Derek rolled his eyes quite heavily at that addition...and then called the labels pretentious [your wife never forgets!] for their larger size. I have also been working on some birthday presents for a March 5th birthday and almost have finished up my Sparkle Outfoxed quilt top. Pictures of both to come soon!